Car bumpers are the first and most often to get hit from back and front which causes a scratch, dent or sometime heavy damage to a bumper from high speed contact and to fix back to their original look required to take out a lot of cash from a pocket including a full day job for repair, to avoid or minimize the risk of bumpers from scratches and dent there is a lot of product available in the market for bumpers protection, however so many car manufacturing companies do have a special designated bumpers guards but not all car owner has have a lot of money to get the guards from a same company due to their too much cost therefore for those who can’t afford same brands guards a few universal car protection bumpers are available which are cheaper and easy to install from Cars to SUVs. T-Rex is not only designed for SUVs but to all vehicles such as Cars, crossovers, larger SUVs, MPV and so on, T-Rex can be fix and remove easily by attaching and detaching straps from a car, Made up of hard rubber almost 0.5 inch thick which is enough to protect from scratches and dents, 72inch long and 8 inch wide a total 240 degree size can easily protect all bumper even corners as well, T-Rex can install to all weathers. Cannot protect Vehicle from outside force neither abrasive. T-Rex use Straps for adjustment and can be stolen easily due to no protection against theft. Similar design and features except more stylish and anti-theft to prevent from being stolen, LUV-Tap basically made upon the reviews of users feedback, this one has two option either fix it by using anti-theft quad embedded steel straps or attach or detach by using parachute buckles. Another features of this guard is you can protect both front and rear guard by adjusting and fix it from anti-quads, 105 x 0.5 x 11 Inch is almost similar in size to a T-Rex. Another most popular guard bumper available in the market with a same design and specification as stated above except more thicker more wider and tall, 2 inch thick and 48 x 12 inch tall is a full proof bumper protection, however the protection limited to small scratches and dents, it doesn’t hold any hard impact therefore keep that in your mind before buying this. Wants to protect from any impact then this one is the right choice, it can protect your vehicle bumper from any impact but limited to a certain force thanks to a more 10mm impact pad, steel reinforced straps that may not easily be cut it out in case of steal situation, in addition this guard has a night reflectors for the upcoming vehicles to get alert from far away, however the other features remain the same as those above have. Different design with more intense protection from rear end, it can absorb huge impact without damaging or scratching bumpers, rough estimates that it can protect 10mph speed impact due to a 4.25pound rubber mat high quality material, best suitable for larger and SUV vehicles. 4 Pcs Status comes in many colors high glossy black, white and silver to be able to do a best contrast with a vehicle, highly durable and effective for bumpers corners protections, if someone wants to protect just the edges of a vehicle bumpers from front and rear within little amount to spend then this one is the right product for them, ultimate edge protector for all vehicles. 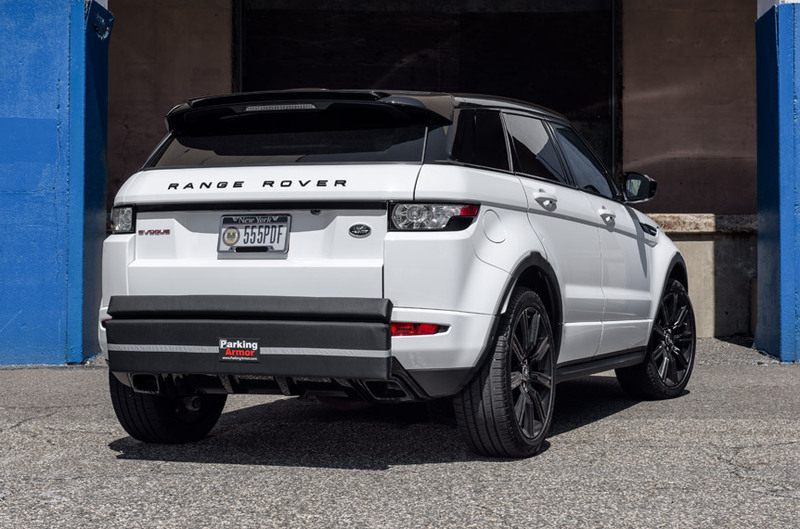 Stylish, elegant and easy to install on a number plate, made from hard steel and protect bumpers from others bumpers approximately 2 inches, it attaches at a license plate level and protect the bumpers to a certain degree, so far the customer response and feedback are excellent with more than 4 star rating on amazon. 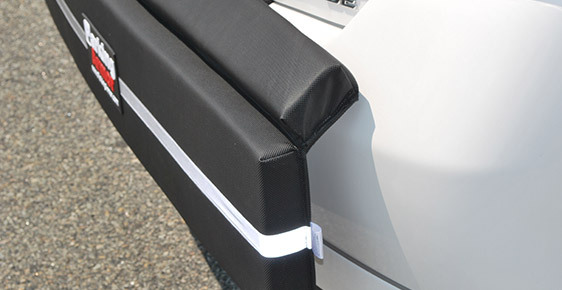 Unprotected bumpers from corners, scratches, dents to a position away from 4bumpers Duo location. This one is design to protect front bumpers from low impact bump and scratches to a limited extent but very effective thanks to a more wider, taller and more thicker from processors products in a same category, 14 inch extra wide, 2.25 inch thick and 8.5 inch taller would be enough to protect a bumper from front side to a limited impact, scratches and dents, in addition this one is very economical and will be suitable for those who can’t afford expensive products. Corners and position away from Bumpshox XL are vulnerable to dents and scratches. Pacer performance is another bumper protector and can be fit front and back bumpers, available in three colors black, silver and white, this impact pad has a weight of 7 ounces and product dimension are 10.6 x 6.2 x 0.9 inches which is more than enough to product from small impacts, minor scratches and dents to a position where they placed, easy to install just by using 3m stick tape. There are so many similar different brands in the market according to their location, so get the best from a similar design as stated above at a place where you live.